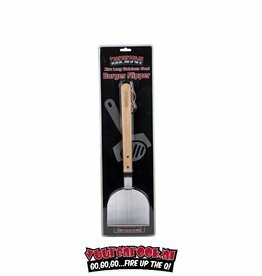 Use this high-quality Pizza Shovel with its extra-long wooden handle to make baking your pizza so much easier! The Pizza Shovel is large enough to slide a big pizza on or off the pizza stone at once. The edges of the Pizza Shovel have a flat finish and a pointed tip so that this Pizza Shovel scoops up pizza's effortlessly. Tip from the BBQ Pitmaster: Use enough flour on the Pizza Shovel but even better: use polenta (maize flour)!